I’m convinced that our existing accountability framework is preventing schools from improving at the pace that they could be or in the way that they should be. OfSTED and Performance Tables dominate the thinking of too many Heads and teachers to a degree that is unhealthy, unnecessary and counterproductive. I have written about these issues in several posts as have many others. For example, in Building a Trust Culture: it’s not all hugs I suggest that accountability and challenge within the system is vital – but also suggest that the prevailing OfSTED-driven culture is not helpful. We have a system a world away from the high-trust culture we need in order to secure improvement. In offering a critique, we must be careful to have some balance. It is quite possibly true that, overall, OfSTED judgements correlate broadly to actual standards of education. It isn’t a lottery or a massive conspiracy against us and, yes, some schools and some teachers should be under pressure to improve dramatically. On the face of it the criteria for Good or Outstanding teaching or leadership seem reasonable. So where’s the problem? Mainly it is that there is a lack of trust and a deep-seated fear of failure that drag the whole system down. (See also F.E.A.R and Plantation Thinking) .For me, the key issues are the mechanistic snap-shot nature of the inspection process and the over-bearing top-heavy intensity of the whole accountability system; the process is deeply flawed and needs to change. Performance Measures include a raft of ‘cliff edge’ factors such as %5A*-Cs including English and Maths that create perverse incentives to introduce short-term quick fix interventions rather than to deepen the learning experience at a fundamental level. Schools and teachers are incentivised to LOOK good rather than to BE good; it feels like hoop-jumping rather than embedding better practice and it often is. The data-focus in our system of school evaluation is based on some flawed assumptions about the validity of the measures as indicators of learning or the quality of education overall. (see The Data Delusion). Despite this, OfSTED judgements are heavily driven by data analysis, reinforced only by snap-shot flying visits by people who have no prior knowledge of the schools. Even though a Head or Governor might take weeks or months to really get to know their school’s strengths and weaknesses, and a community of parents will place value on the education their children receive in myriad ways, OfSTED assume they can categorise schools meaningfully in a couple of days with a few rows of data from RAISEOnline. The system is intensely self-referential so that inspectors only make judgements around a narrow set of criteria limited to those things that can be observed in two days or determined by a few rows of data… if the true quality of education provided by a teacher or school is unobservable or measurable on those terms, it doesn’t count by definition. There is a consensus that ‘a great education’ amounts to more than the sum of what is measurable but the accountability systems don’t take sufficient account of this. And, let’s be honest; it works in both ways: some schools have inflated judgements that don’t match the day-to-day experience; others have a grade that does not do them justice. The prime driver of real improvement is known to be the quality of teaching and learning but this is judged through a series of snap-shot lesson observations; consequently, regardless of what the Chief Inspector says in public, the OfSTED criteria take on Biblical Tablets of Stone status in defining what learning should look like.. even though most lessons are never observed and even though learning can never be accurately or meaningfully measured during a short lesson observation. I am guilty of giving a teacher a ‘Good’ for a lesson on a technicality, even though they are one the most fabulous teachers I know and I don’t think anyone could teach their subject better than they do or get better results. Madness. As I have explained in this post How do I know how good my teachers are? a full evaluation of teacher quality requires triangulation from a range of sets of information, qualitative and quantitative, over time – and this is not how OfSTED do things even if a Self Evaluation Form is written in detail. Heads know their teachers; inspectors do not – they can’t. They don’t know the schools either. The consequences for failure in the system are so dire (eg forced academisation, heads rolling – pun intended) that Heads and Teachers are unable to consider deviating from the parameters that they perceive to be OfSTED approved; a poor lesson grade or a poor overall school grade sets the improvement process back a long way before it moves forward again because the stakes are so high and the impact of a negative judgement is so demoralising. Mea culpa; I’m currently responsible for some of this. The factory model applied to teacher performance – Performance Related Pay for example – does not provide incentives to improve and does not actually succeed in securing improvement. (See my views on this here: Wrong Diagnosis; Wrong Solution). Under-performance that exists in the system is diagnosed as resulting from teachers or Heads who are ‘enemies of promise’ or who are assumed to not be working hard enough. The entire enterprise breeds mass cynicism, builds a chronic defensive culture and de-skills teachers and leaders as it narrows their focus and removes any incentives to provide challenge from within. Schools I work closely with are registering their staff at £1000 a go in large numbers for formal OfSTED Inspector training. Do they spend this kind of money on CPD for developing teaching or leadership? No. Accountability mechanisms need to reflect the complexity of the processes they are designed to evaluate: teaching; learning, leadership, attainment, curriculum, ethos – whatever is included. Simplification for the sake of communication or comparison is inappropriate if it unduly distorts the quality of the information or creates incentives to deviate from deep level improvement. Public scrutiny of school effectiveness is important and it should be possible for parents and other community members to access information that gives a full and rounded picture of the nature and quality of the education provided at any school. Effective accountability needs to secure positive engagement in the change process that will secure embedded, sustained improvement; this can only be done if the people concerned are central to the process. Schools, teachers and learners need to be ‘known’ rather than merely inspected or observed in order to capture a true sense of their successes; their strengths and their areas for improvement ; this requires longitudinal wrap-around, on-going evaluation triangulating a range of quantitative and qualitative sources of information. The snap-shot model is untenable and needs to be removed from the system entirely. School stakeholders should have a say in defining the parameters for measuring their school’s success; this should include processes as well as outcomes in order to provide the fullest possible picture. External challenge is essential to all accountability processes; complacency or tolerance of mediocrity cannot be allowed to go unchallenged so there is a crucial role for trained and experienced professionals with the skills required to work with schools to secure robust accountability. Teaching and learning should be evaluated in terms of their quality over time. Examination and internal assessment outcomes, observed teaching episodes, evidence of progress in students’ work and the quality of feedback should inform any judgements alongside more general feedback about the learning experience from student focus groups and parental surveys. The process should be more formative than summative leading to a clear plan of action for further development at whole-school and teacher level. The notion of the ‘perfect OfSTED lesson’ would be replaced by ‘features of outstanding learning over time’. Data that gives an account of a school’s performance should be provided in detail. No single measure should be used to rank schools or to set floor measures. Recognising that the data itself cannot tell a story, each year a full School Performance Report should be published where schools, working within guidelines, give an account of the data trends that result from public examinations or formal assessments. Any contextual information that helps to explain the trends would be included alongside a statement of actions that the school is looking to take. Crude league tables would not be facilitated by the DFE; parents and other members of the public would be expected to read and compare the reports. Schools should all have three forms of ongoing evaluation so that the detail of its strengths and weaknesses are known and agreed by all concerned. School partnerships with pairs or triads of schools working together as critical friends; the role of ‘challenge’ in these partnerships would need to develop into a key element of professional discourse. Heads would need to challenge each other to improve whilst securing improvement in their own schools; it would be a professional duty to sign off on an agreed evaluation of a partner school. An allocated scrutineer in the mode of the HMIs of the past who would visit their schools regularly; they would know the teachers and leaders in the school; they would know how things were changing over time and what priorities the school was setting itself. They would report to another tier of moderating inspectors and would ensure that the evaluation processes were conducted with rigour. The time spent in each school might vary according to need. Additional specialists could contribute as required. At set-piece times, perhaps once every three years, a school would publish an agreed report for the community containing an account of the ongoing evaluation processes alongside the latest Performance Report. All parties would need to agree the content of the report. There would be no window dressing, no complacency and nowhere to hide. It would be more rigorous and more accurate than current OfSTED reports. This would become a built-in, ongoing process leading to continual improvement, a sense of ownership of the accountability mechanisms and a greater confidence in the entire system. I believe that many of the issues at the top of this post would be addressed. I think what you’re saying Tom is that this is a sensible way to run an organisation that provides a public good. I like the co-evaluation of partners schools, which some would say goes on in good academy chains (is there any evidence about this? ), as well as the moderation of Ofsted inspections – perhaps a role for the new regional directors and a few delegated by them, who could take a proper ‘comparable outcomes’ approach – who knows, this might even help out Ofqual in their regulation of the precarious annual awarding exercise. Most importantly, politicians need to understand their role in the whole accountabilty process and as David Laws said at the ATL conference this week, not employ rhetoric but allow schools and teachers to do what they are good at. Teach. Without wishing to be unduly critical of Ofsted, it would be pertinent to consider what the regulator was put in place to achieve under Baker, for example in terms of a reduction in the percentage of pupils leaving school who are illiterate and innumerate, and ask whether there has been a good return on investment. Is our society significantly more literate and numerate, does this indicate that the education system as a whole is functionally better than it was before the installation of this regulatory regime, is there any evidence that suggests regulatory compliance by schools has improved either the quality of teaching or in learning as compared with the period prior to the instigation of the current regime? If there is no evidence of significant qualitative improvements based upon the expectations inherent in the original programme to set up the regulator, making due allowance for the hermetic envelope that this form of regulatory structure imposes (Ofsted as legislator of criteria, judge, jury etc. ), the question arises as to whether such an environment has any real value in terms of educational outcomes. Tinkering with the system may just impose a different set of perverse incentives and not resolve the fundamental issues, which might require a more dramatic departure from the current model of regulation and compliance. I agree David. Does it make a difference at all? It’s a good question. Certainly it is worth asking whether schools held to account simply at local level, with parental choice to reckon with, would be as good as schools held to account by OfSTED. 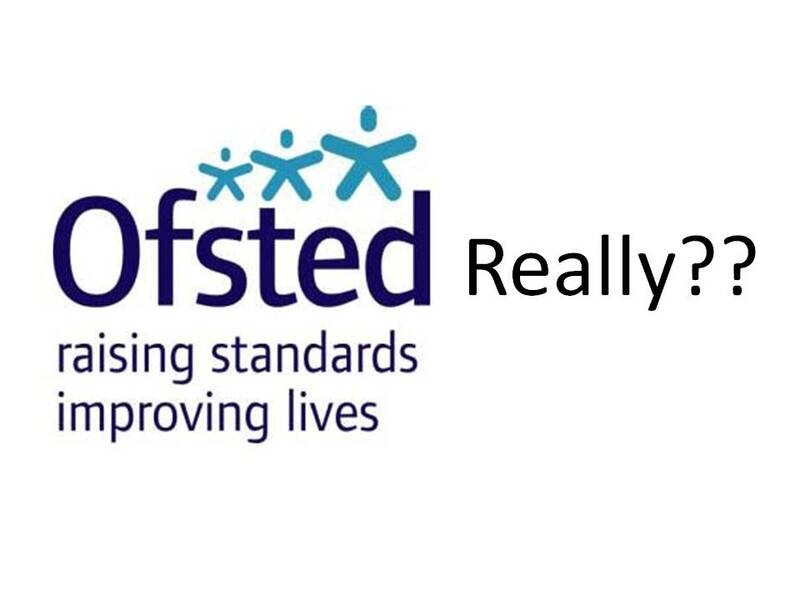 If OfSTED closed overnight, when would we notice.?. And would it be a positive change or negative one? Definitely worth asking that question. I hear from many teachers that they spend too much time preparing for observations, monitoring and things like parent visits rather than getting down to the most important thing, which is helping kids learn. I agree there needs to be accountability and monitoring, but at times it’s complete overkill and actually defeats the object. Too many leaders have forgotten how teachers really work and the time and space teachers need in order to get on with the job properly. If you bake a cake, but keep opening the oven to check it every five minutes, a) it takes longer to cook b) it won’t have risen properly either. Is this more of a primary school problem though? Are secondaries more patient bakers?